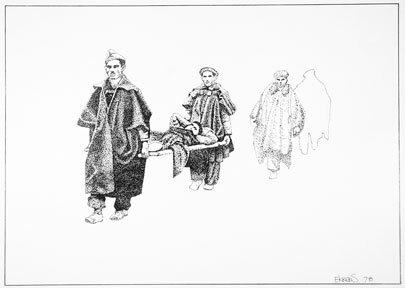 Second in a series of ink stipple illustrations of the Spanish Civil War (1930–39). The struggle was to be fought between the Republicans (the people) and the Nationalists (the army). Earnest Hemingway depicted the people's fight in For Whom the Bells Toll, while Piccaso pictured the horror rained down upon the people in his monumental painting, Guernica. This grouping of rag-tag soldiers are the people's soldiers.